MicroRNA (miR)-mediated regulation of protein abundance is a pervasive mechanism of directing cellular processes. The well-studied and abundant miR-182 has previously been implicated in many aspects of T cell function, DNA repair, and cancer. In this study, we show that miR-182 is the most highly induced miR in B cells undergoing class-switch recombination. To elucidate the requirement of miR-182 in lymphocyte function, we extensively characterized mice with a targeted deletion of Mir182. We show that despite its dramatic induction, loss of miR-182 has minimal impact on B cell development, the ability of B cells to undergo class-switch recombination ex vivo and to undergo Ag-driven affinity maturation in vivo. Furthermore, in striking contrast to knockdown studies that demonstrated the requirement of miR-182 in T cell function, miR-182–deficient mice display no defect in T cell development and activation. Finally, we show that T cell–dependent immune response to experimental Listeria monocytogenes infection is intact in miR-182–deficient mice. We conclude that, contrary to previous studies, miR-182 does not play a significant role in all measured aspects of mouse adaptive immunity. This striking absence of a phenotype highlights the lack of correlation between expression pattern and functional requirement, underscores the limitations of using knockdown approaches to assess miR requirements, and suggests that miR networks may compensate for the chronic loss of specific miRs. Mature IgM+ B cells in secondary lymphoid organs such as the spleen and the lymph nodes undergo class-switch recombination (CSR) to exchange the default Cμ CH region exons for an alternate CH region gene segment (Cγ, Cε, or Cα) (1). The B cell thus shifts from expressing IgM to IgG, IgE, or IgA, with each Ab isotype conferring a distinct effector function during an immune response (1). Mechanistically, CSR is a DNA deletional-recombination reaction occurring between repetitive switch (S) region DNA elements in the IgH locus (IgH). Current models posit that the DNA deaminase AID (activation-induced cytidine deaminase) deaminates cytidines to uridines in S regions. Engagement of base excision and mismatch repair proteins at the deaminated residues generates DNA double strand breaks (DSBs) at acceptor and donor S regions. Synapsis and end joining complete CSR (1). CSR proceeds through the deliberate introduction of DNA lesions and relies on subversion of faithful DNA repair so as to promote accumulations of DSBs and long-range (productive) versus intraswitch (abortive) recombination (2, 3). While obligatory intermediates for CSR, DSBs also constitute one of the most toxic lesions that can occur in a cell, causing either cell death or initiating oncogenic translocations (4, 5). Processes that regulate the activity of AID to generate DNA lesions have been extensively investigated; however, the mechanisms that tip the delicate balance of DNA repair to mediate CSR while simultaneously suppressing genomic instability remain elusive (3, 6). MicroRNAs (miRs) represent a class of small noncoding RNAs that influence gene expression posttranscriptionally via translational repression and/or mRNA degradation (7, 8). During the past two decades, the prevalence and sway of miR-mediated regulation in diverse cellular processes has become increasingly apparent. However, elucidation of miR regulatory mechanisms is often challenging due in part to miRs commonly exhibiting slight effects on an array of targets. This characteristic has led to the conjecture that miRs are often involved in the fine-tuning of cellular processes by hitting multiple nodes within a pathway or among several pathways simultaneously (9, 10). Fine regulation is necessary in instances when even small deviations could be deleterious, and so fine-tuning may play a role in maintaining homeostasis or moderating transitions from one cell state to another. Such a regulatory mechanism would fit well with the transient subversion of DNA repair mechanisms during CSR (2, 3). We therefore hypothesized that miR-mediated regulation plays a role in balancing DNA repair to permit productive CSR. In this study, we have identified miR-182 as the most highly induced miR in B cells stimulated to undergo CSR. miR-182 is a member of the miR-183∼182 cluster encoding miR-96, miR-182, and miR-183, with miR-182 being implicated in many aspects of lymphocyte function, DNA repair, and cancer progression. AntagomiR-mediated depletion experiments demonstrated a central role of miR-182 in IL-2–driven Th cell–dependent immune response through the ability of the miR to regulate expression of the transcriptional factor Foxo1 (11). miR-182 was shown to be a key effector of the suppressor activity of regulatory T cells during an immune response (12). Expression of miR-182 has been associated with a wide variety of tumors including those originating in breast, lungs, thyroid, and ovary (13–16). Finally, miR-182 has been implicated in directly regulating expression of BRCA1 and >30 gene products that participate in BRCA1-dependent homologous recombination DNA repair (17, 18), suggesting miR-182 participates in fine-tuning of DNA DSB response. One such miR-182 target is the mRNA encoding 53BP1, a protein with a well-established role in the DNA repair phase of CSR (19–22). Studies implicating miR-182 not only in regulating lymphocyte development and function but also DNA repair via multiple intrapathway targets, in combination with our identification of miR-182 as the most highly induced miR in B cells undergoing CSR, prompted us to characterize mice with a targeted deletion of miR-182 (23). In striking contrast to published reports, we find that miR-182 is largely dispensable for all measured aspects of lymphocyte function. The generation of Aicda−/− and Mir182−/− mice has been described previously (23, 24). Wild-type (WT) (control) BALB/c mice and C57BL/6 were obtained from The Jackson Laboratory. Mouse colonies were maintained according to Institutional Animal Care and Use Committee policies. The purification of naive mature B cells and stimulation conditions to induce CSR have been described previously (25). IL-5 was used at a concentration of 6 μg/ml in plasma cell differentiation experiments. CSR frequency was determined by flow cytometry (25). Small RNA library preparation and subsequent sequencing was performed by the Memorial Sloan Kettering Cancer Center Genomics Core Laboratory using standard Illumina HiSeq protocol. Raw data were processed by the Memorial Sloan Kettering Cancer Center Bioinformatics Core Laboratory. All quantitative PCR (qPCR) experiments were performed using the following components from Applied Biosystems (Life Technologies): TaqMan miRNA Reverse Transcription Kit (# 4366596), TaqMan Universal Master Mix II, no UNG (# 4427788), TaqMan miRNA Assays (# 4427975: miR-182 ID 002599; miR-96 ID 000186; miR-183 ID 00269; snoRNA251 ID 001236). Data were normalized to snoRNA251. Data analysis was performed using the comparative Ct (threshold cycle) method (26). Standard curve interpolation was used to determine the copy number of miR-182 in different cell types. A standard curve was generated by “spiking” 5′-phosphorylated miR-182 RNA oligonucleotide (miRBase.org) into Mir182−/− RNA samples over a range of dilutions. Bone marrow was flushed out with PBS plus 0.25% FBS from femurs of 8- to 10-wk-old littermate or age-matched male mice. NP (30)-CGG (# N-5055D-5; Biosearch Technologies) was precipitated with 10% alum. Four- to 6-wk-old C57BL/6 WT and Mir182−/− mice were immunized i.p. with 50 μg on day 0 and boosted with 50 μg on day 14. Serum was collected on days 0, 7, 14, and 21, and the mice were sacrificed on day 21. To analyze expression of miR-182 in B cells in vivo, mice were immunized i.p. on day 0 with 100 μg alum-precipitated NP (20–29)-CGG and sacrificed on day 10. Coating Abs for binding IgM, IgG1, IgG2a, IgG2b, IgG3, and IgA were purchased from Southern Biotechnology Associates (# 1020-01, 1070-01, 1080-01, 1090-01, 1100-01, and 1040-01, respectively). Coating Ab for detecting IgE was purchased from BD Pharmingen (# 553413). The following isotype standards were used to calculate absolute concentration values: IgM (# 14-4752-81; eBioscience), IgG1 (# 0102-01; Southern Biotechnology Associates), IgG2a (# M5409; Sigma-Aldrich), IgG2b (# M5534; Sigma-Aldrich), IgG3 (# 553486; BD Pharmingen), IgA (# 553478; BD Pharmingen), and IgE (# 557080; BD Pharmingen). Secondary Abs for detecting IgM, IgG1, IgG2a, IgG2b, IgG3, IgA, and IgE were purchased from Southern Biotechnology Associates (# 1020-05, 1070-05, 1080-05, 1090-05, 1100-05, 1040-05, and 1130-05, respectively). BSA-conjugated NP(8) (# N-5050l-10) and NP(30) (# N-5050H-10) were obtained from Biosearch Technologies. Plates were read at 450 nm on a Biotek Synergy HT detector. Naive CD4 and CD8 T cells from peripheral lymphoid organs were sorted in a flow cytometer based on CD25−CD62L+CD44− cell surface expression. Cells were labeled with CellTrace Violet dye (# C34557; Invitrogen), according to the manufacturer’s protocol, and activated in vitro using plate bound anti-CD3, soluble anti-CD28, and soluble IL-2 for 4 d. Dye dilution was measured using flow cytometry. Mice were i.v. infected with 5 × 103 CFU L. monocytogenes expressing chicken OVA (LM-OVA). Fluorescent-dye-labeled Abs against cell surface markers TCRβ, CD4, CD8, and CD44 were purchased from eBioscience. PE-conjugated Kb/OVA-tetramer was obtained from the Tetramer Core Facility at Memorial Sloan Kettering Cancer Center. Cells were incubated with specific Abs for 30 min on ice in the presence of 2.4G2 mAb to block FcγR binding. To determine IFN-γ and TNF-α expression, lymphocytes were stimulated with 5 μg/ml listeriolysin O (LLO)190–201 for CD4+ T cells or 10 nM SIINFEKL peptide for CD8+ T cells in the presence of GolgiStop (BD Biosciences) for 5 h at 37°C. After stimulation, cells were incubated with cell surface Abs, fixed and permeabilized, and stained with anti–IFN-γ and anti–TNF-α (eBioscience). All samples were acquired with an LSR II flow cytometer (BD Biosciences), and data were analyzed with FlowJo software (Tree Star). The p values were determined by two-tailed unpaired Student t test. A p value < 0.05 was considered statistically significant. All error bars represent SEM. To identify miRs that are involved in tempering DNA repair to allow for the long-range synapsis and incongruent ligation necessary for productive CSR, we isolated naive mature B cells from spleens of WT and AID-deficient (Aicda−/−) mice and generated miR expression profiles for their resting and activated states. Ex vivo activation of splenic B cells was achieved with a combination of anti-CD40 plus IL-4. This approach was designed to identify miRs that are not just strongly induced upon activation but whose induction is also AID-dependent. In doing so, we aimed to narrow our search to miRs that respond specifically to DNA damage caused by AID activity. We used a simple measure, which we called the fold-change ratio (FCR), to rank the disparity in fold-change induction upon activation between WT and Aicda−/− B cells. We thereby generated a list of 30 abundant miR candidates that exhibited FCR > 1.5 or < 0.667 (Supplemental Fig. 1). 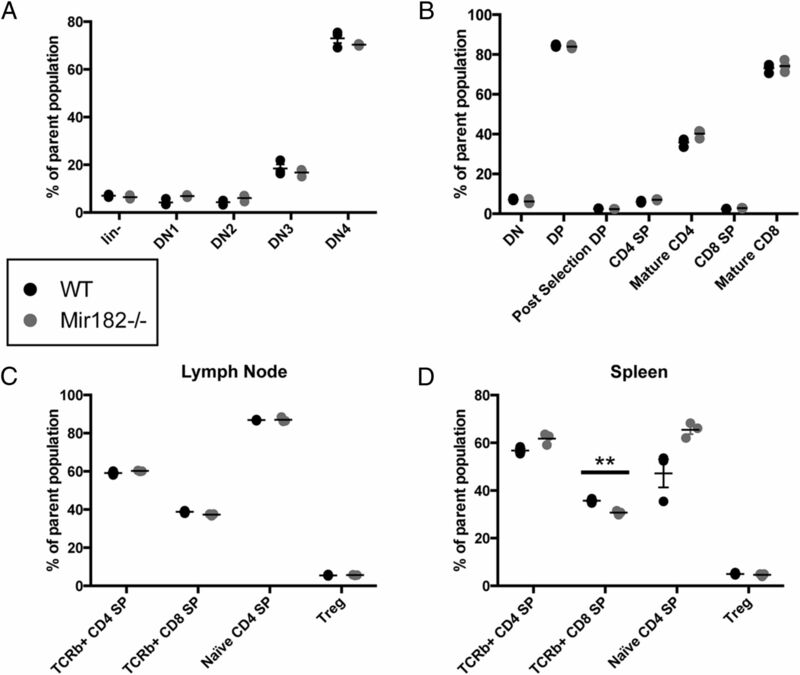 miR-182 was identified as the most strongly induced miR upon B cell activation (Fig. 1A). There was an ∼90-fold induction of miR-182 expression in WT B cells activated to undergo CSR. This induction was significantly dampened (to ∼30-fold) in Aicda−/− B cells, suggesting that the enhanced induction could be dependent on AID-induced DNA breaks (Fig. 1A, inset). miR-182 is abundantly expressed because it easily falls in the top 10% of expressed miRs in activated B cells and is readily quantifiable in activated lymphocytes (Fig. 1B, 1C). In addition, normalized sequencing counts showed that miR-182 clusters with, and in most cases outnumbers, other miRs reported to play a role in B cell biology (27) (Fig. 1B, Supplemental Fig. 1). The induction of miR-182 expression upon activation of B cells was also observed in independent qPCR analysis of ex vivo stimulated (Fig. 1D) and in vivo–activated B cells (Fig. 1E). Because miR-182 has been strongly implicated in DNA repair, we extensively characterized B cells derived from mice with a targeted deletion of miR-182 (Mir182−/−) (23). 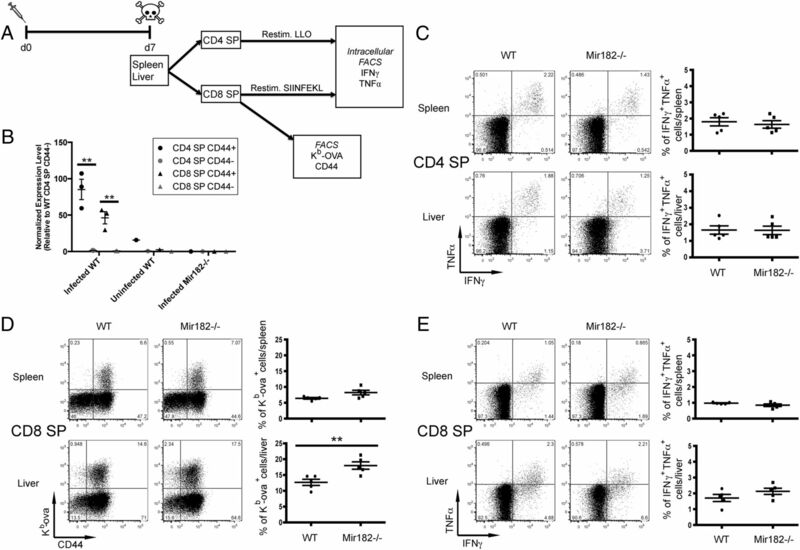 miR-182 was not detected in B cells from Mir182−/− mice (Fig. 1D). miR-182 is strongly induced upon B cell activation in an AID-dependent manner. (A) Expression fold-change of top 30 miR candidates in WT B cells (activated/resting) identified by miR expression profiling. n = 3. Inset, Expression fold-change of miR-182 and miR-155 (activated/resting). FCR = fold-change WT/fold-change Aicda−/−. (B) Normalized sequencing counts of all expressed miRs were ranked and plotted. Marked “functional miRs” refer to miRs in which there is published evidence citing a role in B cell development and/or function (27). (C–E) TaqMan qPCR was used to monitor expression of miR-182. (C) Approximate miR-182 absolute copy number was determined by interpolation on a standard curve generated using synthesized miR-182 RNA spiked into Mir182−/− RNA sample over a dilution series. n = 3 for WT 96-h samples, n = 1 for other samples. (D) Mature splenic B cells were isolated and stimulated with anti-CD40 (0.5 μg/ml) and IL-4 (12.5 ng/ml). n = 3. (E) WT C57BL/6 mice immunized with NP(20–29)-CGG were sacrificed day 10, and indicated cell populations were FACS-sorted from splenocytes. *p < 0.1, ***p < 0.001, ****p < 0.001 (t test). Initially we characterized B cell development in Mir182−/− mice. Cell numbers in the bone marrow and spleen were similar between WT and Mir182−/− mice (Fig. 2A). No significant difference in the frequency of pro-, pre-, and immature B cell populations in the bone marrow was observed (Fig. 2B). Thus, early B cell development appears unaffected by absence of miR-182 and strongly suggests that V(D)J recombination, another process heavily reliant on DNA repair (28), remains intact. There was a statistically significant, albeit modest, decrease in the frequency of mature B cells (B220+CD43−) in total splenocyte populations from Mir182−/− mice (Fig. 2C). This difference was not reflected in the frequency of total (B220+IgM+) and mature (IgMloIgDhi) B cells (Fig. 2C), suggesting that the slight reduction in percentage of B cells in spleen is due to a mild perturbation in the non-B cell population, which could include T cells, macrophages, dendritic cells, and other stromal cells. Furthermore, the frequencies of immature (IgMhiIgDlo), IgMhiIgDhi, T2-transitional (CD23+IgM+CD21hi), follicular (CD23+IgM+CD21lo), marginal zone (CD23−IgMhiCD21hi), and bone marrow recirculating (B220hiIgM+) B cell populations were all equivalent (Fig. 2C, 2D). There was a small but statistically significant decrease in the percentage of T1-transitional B cells (CD23−IgMhiCD21lo) in Mir182−/− mice (Fig. 2D). Overall, we conclude that B cell development is not impaired in Mir182−/− mice. B cell development and CSR are unperturbed by miR-182 deficiency. (A) Cellularity of bone marrow and spleen. (B) Bone marrow was analyzed for immature (B220loIgM+) and recirculating (B220hiIgM+) B cells as a percentage of live singlets. B220loIgM− B cells were gated and examined for pro- (CD43+) and pre- (CD43−) B cells. (C and D) Splenocytes were analyzed for relevant B cell populations. Parent population for B220+CD43− and B220+IgM+ B cells is live singlets. Parent population for immature (IgMhiIgDlo), IgMhi IgDhi, and mature (IgMloIgDhi) is B220+ live singlets. Parent population for follicular (IgM+CD21lo) and T2 transitional (IgM+CD21hi) B cells is B220+CD23+ live singlets. Parent population for T1 transitional (IgMhiCD21lo) and marginal zone (IgMhiCD21hi) B cells is B220+CD23− live singlets. (E) Primary mature splenic B cells were stimulated with anti-CD40 and IL-4 and assayed for surface IgG1 expression by flow cytometry. (F) Splenic B cells were stimulated with LPS and assayed for surface IgG3 expression by flow cytometry. (G) Splenic B cells were stimulated with anti-CD40, IL-4, and IL-5 and assayed for surface CD138 (syndecan) expression by flow cytometry. *p < 0.1 (t test). To determine the requirement of miR-182 in CSR, we stimulated splenic B cells ex vivo with anti-CD40 and IL-4 and assayed for CSR to IgG1. Despite the dramatic induction of miR-182 expression (Fig. 1), loss of miR-182 had no impact on the ability of B cells to undergo CSR to IgG1 (Fig. 2E). Likewise, splenic B cells from Mir182−/− mice cultured with LPS underwent CSR to IgG3 at WT levels (Fig. 2F). Thus, loss of miR-182 had no effect on the intrinsic ability of B cells to undergo CSR in culture. In addition, miR-182 did not influence the differentiation of activated B cells into Ab-secreting plasma cells as measured by surface expression of CD138 (syndecan) following stimulation of splenic B cells with anti-CD40, IL-4, and IL-5 (Fig. 2G). To assess the participation of miR-182 in secondary diversification of B cells in vivo, we analyzed WT and Mir182−/− mice following immunization with the T cell–dependent Ag NP-CGG (Fig. 3A). The fraction of germinal center B cells (GL7+Fas+) in spleens of immunized WT and Mir182−/− mice was similar, and as expected (24), markedly lower than that from Aicda−/− mice (Fig. 3B, 3C). Analysis of serum of immunized mice failed to show any significant difference in immunization-dependent secretion of various Ab isotypes (Fig. 3D), indicating that in vivo CSR in response to NP-CGG was normal and further bolstering the claim that plasma cell differentiation does not rely on miR-182. Finally, to assess Ag-specific affinity maturation, we probed for low- and high-affinity NP-specific serum Abs via the binding of NP(30)- and NP(8)-BSA, respectively. Both low-affinity (Fig. 3E) and high-affinity (Fig. 3F) NP-specific Abs were generated at normal levels in Mir182−/− mice. Overall, the B cell–dependent immune response in Mir182−/− mice was typical, displaying no statistically significant differences with WT mice. Although there may be a trend for slightly lowered production of some isotypes, the magnitude of the difference is unlikely to be biologically relevant. Importantly, the primary isotype induced by NP exposure, IgG1, is clearly produced at rates similar to WT counterparts. We conclude that miR-182 plays a minimal role, if any, in B cell development and B cell function during a primary response to a T cell–dependent Ag. 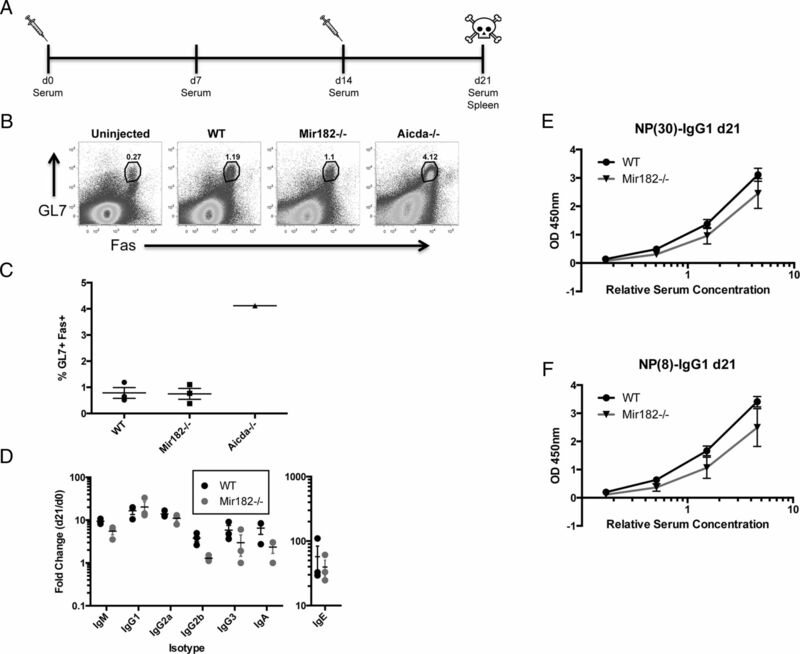 Ag-dependent primary B cell response is normal in Mir182−/− mice. (A) Schematic of NP-CGG immunization protocol. (B) Abundance of germinal center B cells (GL7+Fas+) following NP-CGG immunization was assessed by flow cytometry. Aicda−/− mice, which have significantly higher germinal center B cells (24), were used as controls. (C) Quantification of germinal center B cells in immunized mice. (D) Fold change in serum isotype concentrations upon NP-CGG immunization, determined by ELISA. (E and F) Detection of low-affinity (E) and high-affinity (F) NP-specific IgG1 serum Abs by ELISA. A significant body of work has evaluated the role of miR-182 in T cell function. Transient knockdown of miR-182 using antagomiR technology suggested it was critical in CD4+ helper T cell activation, clonal expansion, and in vivo function (11, 12). A detailed examination of Mir182−/− mice revealed no significant differences in thymic and peripheral T cell populations. The proportions of developing double-negative CD4−CD8− (DN), double-positive (DP) CD4+CD8+, single-positive CD4+/CD8+ (SP), and mature CD4+/CD8+ SP cells in the thymus (Fig. 4A, 4B, Supplemental Fig. 2), as well as the fraction of mature CD4+/CD8+ SP and T regulatory cells in the periphery (Fig. 4C, 4D, Supplemental Fig. 2), was similar between WT and Mir182−/− mice, arguing against a role for miR-182 in T cell development. T cell development is unimpaired in Mir182−/− mice. (A and B) Thymic T cell populations observed by flow cytometry. (A) Parent population for lin− is live singlets. Parent gate for DN1-4 is lin−. Lin markers = CD19, CD4, CD8a, TCRβ, TCRγδ, CD11b, CD11c, Nk1.1, Ly6G(Gr1), and Ter119. (B) Parent population for DN, DP, CD4 SP, and CD8 SP is live singlets. Post Selection DP is percent CD69+TCRβ+ of CD4+CD8+ live singlets. Mature CD4/CD8 SP is percent CD69−CD62L+ of CD4+/CD8+ SP live singlets. (C and D) Analysis of peripheral T cell populations from lymph nodes (C) or spleen (D). Parent population for CD4/CD8 SP is live singlets. TCRβ+ DN/DP/CD4 SP/CD8 SP is percent DN/DP/CD4+SP/CD8+ SP of TCRβ+ live singlets. Naive CD4 SP is percent CD62L+CD44− of CD4+ SP live singlets. T regulatory cell is percent CD25+CD44− of CD4+ SP live singlets. To assess proliferation of T cells upon activation in culture, naive splenic CD4 SP T cells from WT and Mir182−/− mice were stimulated ex vivo with anti-CD28, anti-CD3, and IL-2. Indeed, miR-182 was strongly induced upon activation of WT CD4+ Th cells, as well as CD8+ cytotoxic T cells (Fig. 5A). However, there was no significant difference in viability (as assessed by live/dead staining) or proliferation (as measured by CellTrace dye dilution) of CD4 T cells upon activation (Fig. 5B, 5D), in direct contrast to results observed with transient knockdown (11). Likewise, no difference was found in viability and proliferation of cytotoxic T cells upon activation (Fig. 5C, 5E). 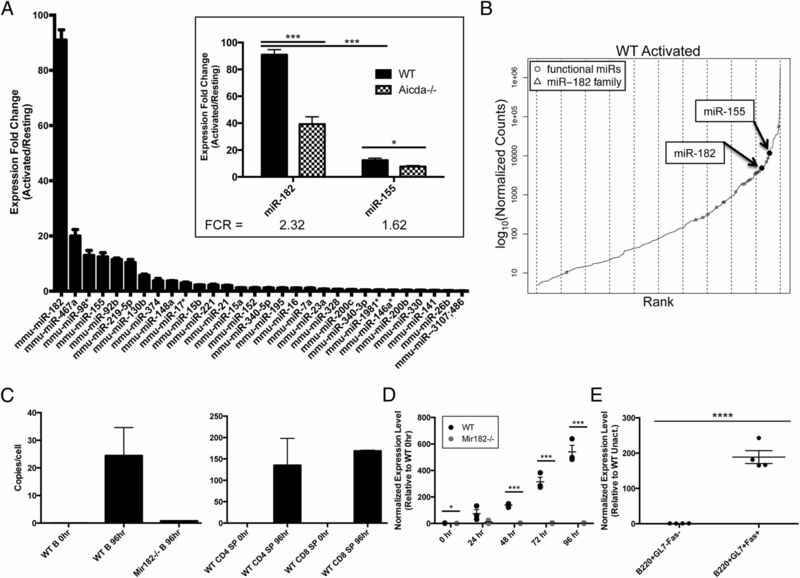 T cell activation is normal in Mir182−/− mice. (A) Sorted naive splenic SP T cells were isolated from indicated mice and stimulated with plate-bound anti-CD3 (1 μg/ml), soluble anti-CD28 (4 μg/ml), and soluble IL-2 (1 U/ml), and TaqMan qPCR was used to monitor expression of miR-182. (B and C) Sorted naive splenic SP T cells were isolated from indicated mice and stimulated with plate-bound anti-CD3 (10, 1, or 0.2 μg/ml), soluble anti-CD28 (2 μg/ml), and soluble IL-2 (50, 25, 10, or 1 U/ml). Bar graphs depict percent viability for CD4+/CD8+ SP T cells over stimulation conditions used. (D) Histogram overlay depicts representative CellTrace dilution profiles of CD4+ SP T cells stimulated with anti-CD3 (1 μg/ml), anti-CD28 (2 μg/ml), and IL-2 (1 U/ml). Representative proliferation index for same stimulation conditions is shown. (E) Histogram overlay depicts representative CellTrace dilution profiles of CD8+ SP T cells stimulated with anti-CD3 (10 μg/ml), anti-CD28 (2 μg/ml), and IL-2 (10 U/ml). Representative proliferation index for CD8+ SP T cells stimulated with anti-CD3 (1 μg/ml), anti-CD28 (2 μg/ml), and IL-2 (25 U/ml) is shown. (B–E) Data representative of two experiments. (A–E) n = 3, *p < 0.1 (t test). To functionally test in vivo immune response to a pathogen, we infected WT and Mir182−/− mice with L. monocytogenes expressing chicken OVA Ag to induce a well-characterized systemic infection. CD4+ and CD8+ SP T cells were isolated from spleen and liver after 7 d (Fig. 6A). miR-182 was markedly induced upon in vivo activation of T cells infected with L. monocytogenes (Fig. 6B). It is noteworthy that, although CD44+ T cells can be detected in uninfected mice, robust induction of miR-182 in these cells occurs only upon infection (Fig. 6B). Sorted CD4+ and CD8+ SP T cells were restimulated ex vivo with LLO or OVA-derived SIINFEKL peptide, respectively (Fig. 6A). No difference in effector cytokine production, as measured by the percentage of cells expressing intracellular IFN-γ and TNF-α, was detected in both spleen and liver for CD4+ SP (Fig. 6C) and CD8+ SP (Fig. 6E) cells. Similarly, there was only minimal perturbation in the abundance and activation of OVA-specific cytotoxic T cells (Fig. 6D). Thus, Mir182−/− mice present no defect in the systemic immune response to L. monocytogenes. This contradicts previously published work that implicated miR-182 in promoting the in vivo function of Th cells (11), although different approaches were used to test functional relevance. miR-182 deletion does not impair immune response to L. monocytogenes. (A) Schematic for i.v. infection with L. monocytogenes-OVA and subsequent analysis. (B) WT and Mir182−/− mice were infected with L. monocytogenes and sacrificed on day 7. Indicated cell populations were FACS sorted from splenocytes and analyzed for miR-182 expression by TaqMan qPCR. **p < 0.01 (t test). (C) Indicated cells were restimulated ex vivo with LLO peptide for 3 h and then analyzed by flow cytometry for intracellular effector cytokines. (D) Indicated cells were analyzed for surface expression of CD44 and OVA-specific TCR-β. (E) Indicated cells were restimulated ex vivo with SIINFEKL peptide for 3 h then analyzed by flow cytometry for intracellular effector cytokines. (C–E) **p < 0.01 (Mann–Whitney U test). Our results clearly demonstrate a striking lack of phenotype in a broad survey of the adaptive immune system in Mir182−/− mice. There is thus a remarkable lack of correlation between its expression pattern and role in B cells. This is contrary to the well-documented role of miR-155 in B cell development and CSR (29–31), even though induction of miR-155 is significantly less robust than that of miR-182 (Fig. 1). Although miR-182 has been strongly implicated in DNA repair, it is evident that the repair modulatory activity is not relevant to either CSR or to suppression of lymphomagenesis as Mir182−/− mice are not tumor prone (data not shown). One explanation for the lack of a B cell defect is functional compensation by miR-183 and miR-96, both of which are expressed from a polycistronic transcript together with miR-182 and whose expression is not altered in either direction in Mir182−/− B cells (Supplemental Fig. 3). Analysis of mice with deletion of this entire miR cluster could address the possibility of compensation. The lack of phenotype in T cells is even more striking given that multiple reports have demonstrated a role of miR-182 in T cell function (11, 12). The failure to recapitulate observations derived from antagomiR-knockdown experiments could be due to off-target effects of knockdown technology. However, our results could also hint at an underappreciated malleability of miR networks upon long-term deprivation of one of its components. The potentially disparate biological consequences of acute and chronic miR deficiency beg careful reevaluation of published miR knockdown studies and consideration in future interpretations of miR modulation experiments. We thank members of the Chaudhuri laboratory for helpful discussions and suggestions. We also thank members of the Ventura, Rudensky, Shaknovich, and Li laboratories for reagents and technical and conceptual advice and Gaspare La Rocca for supportive discussions. This work was supported by National Institutes of Health Grant 1RO1AI072194 and a Starr Cancer Consortium Grant (to J.C.). 2011. Complex regulation and function of activation-induced cytidine deaminase. Trends Immunol. 32: 194–201.
. 2014. Regulation of immunoglobulin class-switch recombination: choreography of noncoding transcription, targeted DNA deamination, and long-range DNA repair. Adv. Immunol. 122: 1–57.
. 2008. AID is required for germinal center-derived lymphomagenesis. Nat. Genet. 40: 108–112.
. 2013. Regulation of AID, the B-cell genome mutator. Genes Dev. 27: 1–17.
. 2009. MicroRNA control in the immune system: basic principles. Cell 136: 26–36. 2013. MicroRNAs in hematological malignancies. Blood Rev. 27: 143–154.
. 2012. Transcriptome-wide miR-155 binding map reveals widespread noncanonical microRNA targeting. Mol. Cell 48: 760–770.
. 2013. miR-182 and miR-10a are key regulators of Treg specialisation and stability during Schistosome and Leishmania-associated inflammation. PLoS Pathog. 9: e1003451.
. 2014. A ten-microRNA signature identified from a genome-wide microRNA expression profiling in human epithelial ovarian cancer. PLoS One 9: e96472.
. 2014. Increased expression of miRNA-182 in colorectal carcinoma: an independent and tissue-specific prognostic factor. Int. J. Clin. Exp. Pathol. 7: 3498–3503.
. 2014. Suppression of MIM by microRNA-182 activates RhoA and promotes breast cancer metastasis. Oncogene 33: 1287–1296.
. 2009. Aberrant miR-182 expression promotes melanoma metastasis by repressing FOXO3 and microphthalmia-associated transcription factor. Proc. Natl. Acad. Sci. USA 106: 1814–1819.
. 2011. miR-182‑mediated downregulation of BRCA1 impacts DNA repair and sensitivity to PARP inhibitors. Mol. Cell 41: 210–220.
. 2013. MicroRNA-182-5p targets a network of genes involved in DNA repair. RNA 19: 230–242.
. 2010. 53BP1 regulates DNA resection and the choice between classical and alternative end joining during class switch recombination. J. Exp. Med. 207: 855–865.
. 2013. 53BP1 alters the landscape of DNA rearrangements and suppresses AID-induced B cell lymphoma. Mol. Cell 49: 623–631.
. 2004. 53BP1 links DNA damage-response pathways to immunoglobulin heavy chain class-switch recombination. Nat. Immunol. 5: 481–487.
. 2004. 53BP1 is required for class switch recombination. J. Cell Biol. 165: 459–464.
. 2009. Targeted deletion of miR-182, an abundant retinal microRNA. Mol. Vis. 15: 523–533.
. 2009. Specific recruitment of protein kinase A to the immunoglobulin locus regulates class-switch recombination. Nat. Immunol. 10: 420–426.
. 2013. The role of microRNAs in B-cell development and function. Cell. Mol. Immunol. 10: 107–112.
. 2011. Recombination centres and the orchestration of V(D)J recombination. Nat. Rev. Immunol. 11: 251–263.
. 2008. MicroRNA-155 suppresses activation-induced cytidine deaminase-mediated Myc-Igh translocation. Immunity 28: 630–638.
. 2008. MicroRNA-155 is a negative regulator of activation-induced cytidine deaminase. Immunity 28: 621–629.
. 2007. microRNA-155 regulates the generation of immunoglobulin class-switched plasma cells. Immunity 27: 847–859.